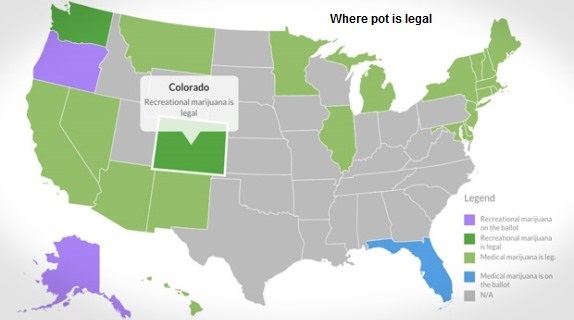 The problem for the governors is that marijuana is illegal at the federal level, though several states have voted to legalize and regulate the recreational marijuana market in recent years. So, according to federal law marijuana isn’t “legal,” it merely appears to be so because Obama refused to enforce the law, as he did with immigration law and so many of the other laws passed by Congress. And in the case of the federal “legalization” of marijuana he didn’t even use an Executive Order or other formal document that might be challenged in court. According to the Business Insider’s Jeremy Berke, the heart of the issue is a 2013 Obama Administration directive — known as the Cole Memorandum — which stipulates that the Justice Department place "low priority" on enforcing marijuana laws against businesses and organizations that comply with state law. Attorney General Jeff Sessions has indicated a willingness to re-write the Cole Memo, in order to direct the Justice Department to crack down on marijuana businesses that comply with state laws but are still illegal at the federal level. Berke says the Justice Department contacted Colorado officials in March regarding marijuana cases, International Business Times reported, saying they hope it will lead to "positive changes" for the "new administration." The governors’ letter claims that overturning the Cole Memo would "divert" existing marijuana inventory to the black market, which would cause an uptick in crime and states to forgo the much-needed tax windfall legalized marijuana provides. Further, the governors called the Financial Crimes Enforcement Network (FinCEN) — which provides guidance for banks and other institutional investors to provide services to marijuana companies — "critical" to the success of a regulated market. "We look forward to working with you and your administration. We stand ready to have further discussion on how these important federal policies work in our states," the governors wrote. So, the governors aren’t merely asking for Attorney General Sessions and Treasury Secretary Mnuchin to forebear enforcing the federal criminal laws, they are asking them to proactively facilitate criminal activity. By asking the Financial Crimes Enforcement Network (FinCEN), through executive fiat, to legalize illegal marijuana transactions they are asking the Trump administration to go beyond even the Obama administration’s lawlessness in facilitating a network of illegal business activity. The Business insider’s Berke quotes Jesse Alderman, an attorney at the Boston-based Foley Hoag LLP who works with marijuana-industry clients, who claims that while Attorney General Sessions may want to overturn the Cole Memo, "the regulated sale and decriminalization of cannabis is uniquely popular across the political spectrum." Recent polls show that around 60% of adults support legalizing marijuana, across the political spectrum claims Berke, but if that is the case why not take the legalization effort to Congress and pass laws decriminalizing marijuana? The problem for the marijuana legalization movement is that this appears to be an elite vs. heartland issue, where liberal coastal and urban areas wish to impose their looser mores on conservative heartland communities who generally have little appetite for legalizing drugs – thus the necessity of backdoor legalization at the federal level via Obama-style memoranda, rather than straightforward decriminalization passed by Congress. Please tell us what you think in the comments: Should President Trump and Attorney General Jeff Sessions continue Obama’s policy of backdoor marijuana legalization? Submitted by J.D. Grimes on Thu, 04/06/2017 - 11:19. I oppose decriminalization of marijuana by any means, but certainly it should not happen through turning the federal government into a criminal that ignores its own laws. The Trump administration should see that these laws are fully enforced. If that is going to create a rash of criminals in these states, that is a situation that they have created, and one that they'll have to deal with the consequences of.